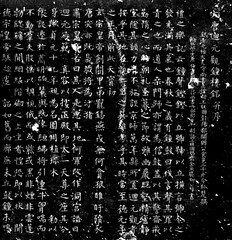 Liu Gongquan (柳公權, 柳公权, 778-865) courtesy name Chengxuan (誠懸), was a Chinese calligrapher who stood with Yan Zhenqing (顏真卿) as the two great masters of the late Tang era. A minister of the Tang dynasty like Yan, Liu was a native of today's Tongchuan, Shaanxi. 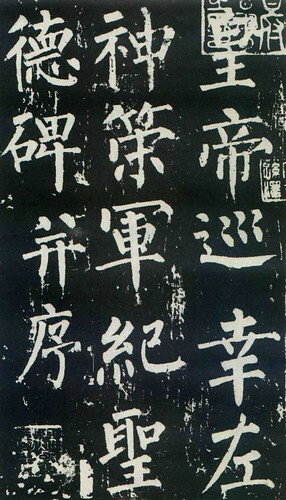 He was a devout Buddhist and follower of Yan's style of writing. 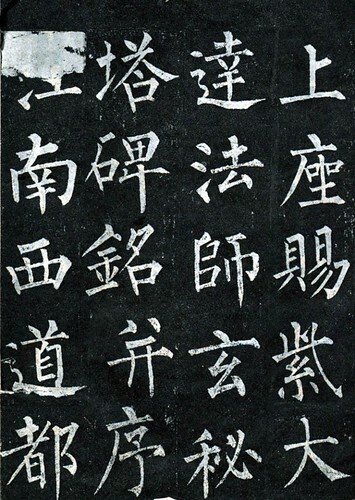 Just like Yan, Liu Gongquan also became an expert of the Regular Script, Liu's works were imitated for centuries and he is often referred in unison with his famed predecessor as "Yan-Liu". Liu’s characters are thinner than that of Yan. 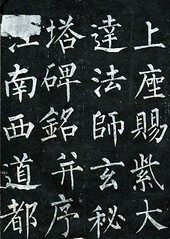 Their calligraphy pieces are known as “Yan’s tendons and Liu’s bones” (顏筋柳骨). This expression is commonly used to praise well-written Regular Scripts. 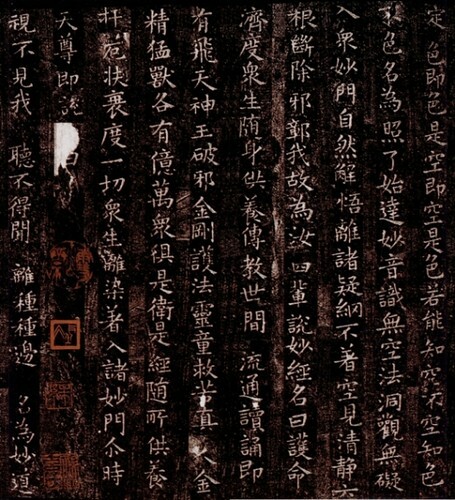 Besides calligraphy, Liu Gongquan also dealt with theory and the more spiritual and mystical sides of art. Liu spoke about the relationship between the mind and the brush and the process of visualizing the final creation before it is actually executed on the paper or silk. According to Liu, this involves well cultivated spiritual abilities and is not simply imagining in the everyday sense. This approach was also common to painting and can be dated to the great theorist and painter Gu Kaizhi. 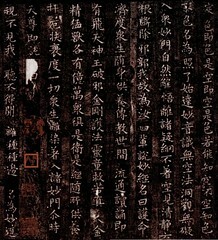 There is an amusing anecdote about the emperor asking Liu Gongquan how to write upright characters. 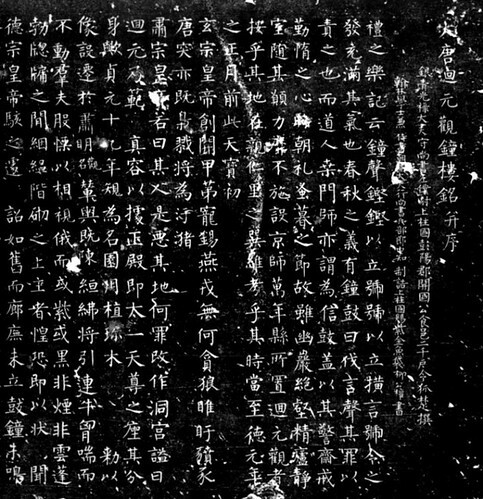 Instead of giving the emperor some technical advice Liu told him that it all depended on one’s mind and integrity, once these were achieved it was then possible to write upright characters. This story survived as an example of the Chinese strong emphasis on the necessity of forming good moral characters as a basis for artistic creation.